84% of Millennials have said they would relocate for a specific job. Evidence suggests this is because Millenials are starting families later in life and instead focusing on their careers. Therefore, companies will likely find that their top talent will be much more flexible when it comes to relocating. With this shift in mindset, employers need to be conscious of not just modernizing their policies, but predicting what’s next so they can stay competitive. To understand what the future of relocation holds, observing the trajectory of current relocation industry trends is key. With 84% of millennials claiming they would move for a specific job, why are relocation rates at an all-time low? 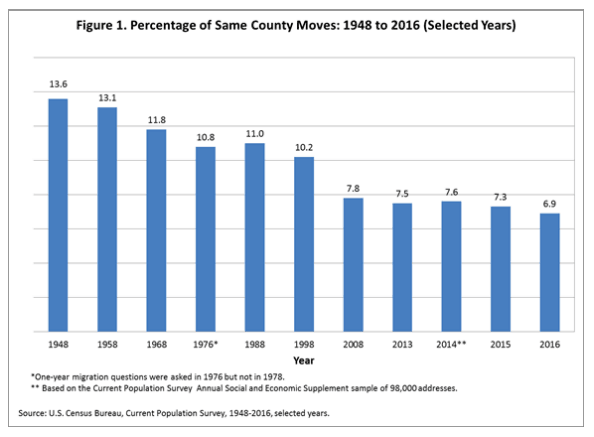 According to the U.S. Census Bureau, the percentage of the population that moved within the same country decreased from 13.6% in 1948 to 6.9% in 2016. Many theorize that the state of the labor market is to blame for this sharp decline. A paper from The National Burea of Economic Research developed a model to measure the causality of this decline. There were two main takeaways from the analysis: “We find a decline in the wage gain associated with changing employers, but no change in the wage gain associated with staying at the same employer.” The disruption of this delicate balance has resulted in fewer people relocating because the offer from the potential employer — the combination of wages and benefits — is not lucrative enough. Rise of remote workers: Almost any white collar job can now be worked from a remote location. Therefore, even if a person changes employers, it’s no longer always necessary for them to relocate. Range in occupations: It used to be that occupations were geographically defined. Now, the range of occupations offered within the metropolitan areas has diversified. This has reduced the need for people to migrate to different areas for a specific career path. So, what does this mean for your relocation policy? To bring the best talent to your company, it’s important to create a relocation package that is valuable to an employee. However you choose to construct this package, the internal cost-benefit analysis an employee does must tip in favor of relocation. How do you do this? Millennials now make up 35% of the workforce — outnumbering Gen Xers and Baby Boomers. Meaning, you need to create a relocation plan that appeals to this generation to remain competitive. There are many ways to do this, but one idea gaining traction is the core-flex mode. The Core-Flex Model gives an employee certain core benefits in their relocation packages, but additional flex benefits based on the employee and position. This model is becoming very popular. In fact, many say it’s the future of relocation policy. The core flex plan is attractive to employees and employers because of its ability to mold to individual needs. It is also attractive to companies because it allows talent acquisition teams to provide more benefits. These factors lead to more satisfied employees who possess strong talent. In the past, companies typically offered a set relocation policy to a select few. 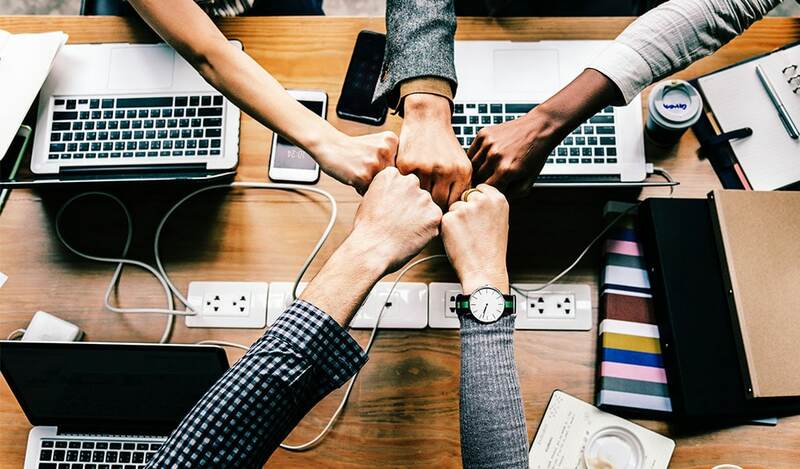 Most companies are finding that flexibility gives them better employee satisfaction and an easier time attracting new talent to their company. Companies are also finding that a core-flex program makes their top-performing employees willing to relocate. If you find that your business is lacking new talent or flexibility from top workers, it may be time to revisit your relocation policies. Download our report, “The State of Employee Relocation” to uncover information about what your business needs to maintain their competitive edge in today’s fast-paced hiring market.